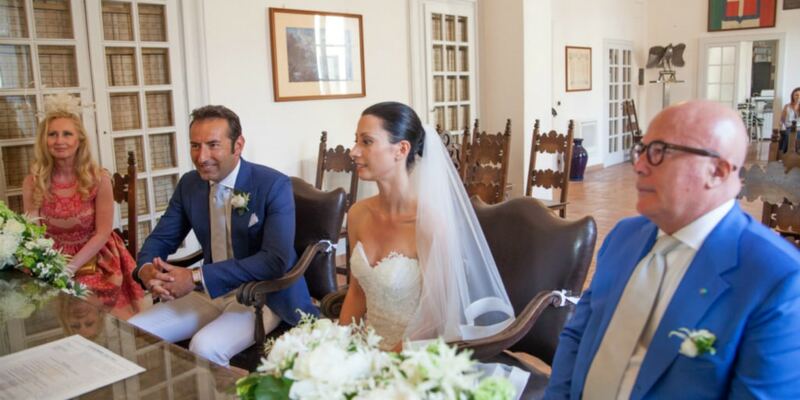 A civil ceremony in Capri is recognized as a legal marriage throughout the world, and can take place not only at the City Hall in Capri or Anacapri, but also at a variety of locations approved by the local municipality. You can have a bespoke civil ceremony on a big terrace with just the sea and the Faraglioni rocks before you, at an opulent historical museum, in a garden with countless colorful blossoms, on a scenic patio atop a mountain with a 360° beyond view of the Gulf of Naples and the Amalfi Coast, at a tiny and intimate venue immersed in nature and perfectly suited for an elopement or small wedding, or in a more rustic yet romantic pine forest just above the Blue Grotto. In addition, some private properties such us hotels have given permission to perform civil ceremonies. For a complete list of outdoor beautiful places where it is possible to have a civil ceremony we invite you to have a look at our VENUE section. We are able to provide you with assistance with all of the paperwork to fulfil the legal requirements for your your civil ceremony in Capri. We can also assist you in booking the civil ceremony location and paying the fee on your behalf, provide you with an interpreter and witnesses if you don’t have your own, and we will ensure that all of the documents are properly translated and legally executed. Contact us for more information about your civil wedding in Capri.